Clustering (aka cluster analysis) is an unsupervised machine learning method that segments similar data points into groups. These groups are called clusters. I regard segmentation as a data analysis technique for creating groups from a dataset while I regard clustering as a data science technique for more advanced creation of groups called clusters. 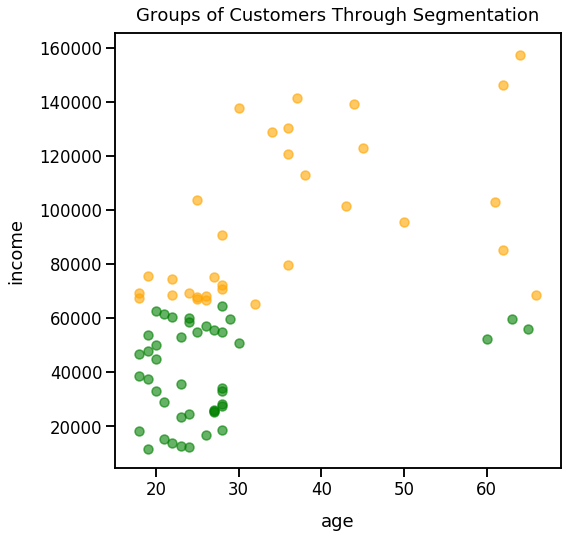 Let's first walk through a simple segmentation example with generating data, analyzing the data and segmenting groups with a visualization. No knowledge of coding needed to follow along. 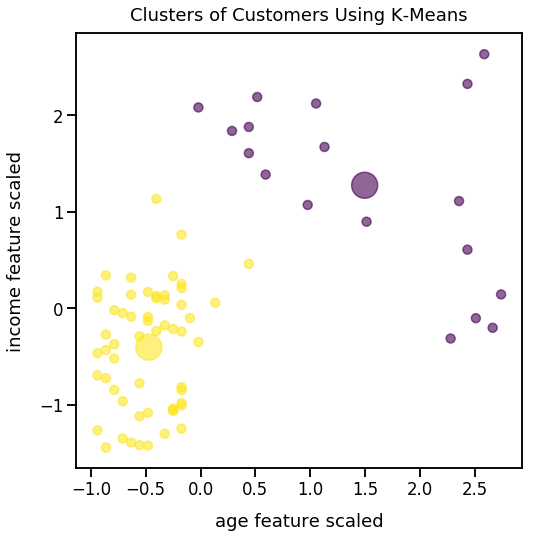 You can can read the text and visualizations to understand the value of clustering. Let's say you have customers use your app, and you'd like to perform more targeted marketing towards them. Historically, you've created videos to highlight a new feature and showed the same video to all customers. However, the marketing message in those videos hasn't been relevant for all customers. With a new feature launch, you'd like to develop two short marketing videos - each of which can be geared towards a unique group of customers. But how can you easily find two different group based on their activity within the app? One way to answer this question is through segmentation; another method I'll illustrate later is clustering. To gather more information on our customers, you poll them on their age and annual income in U.S. dollars. In the table above, every row is considered an observation. Every column is considered a feature. We'll use this terminology going forward. I'll use Python to generate the survey data. We'll create a large group of relatively young customers and another smaller group of relatively older customers who often earn more than the younger ones. In the visualization below, we can see some closely-knit groups of observations (our customers). We have lots of observations who are in the age range of 18 to 28 and earn on average roughly 50,000 U.S. dollars per year. Another more spread out group could be observations over the age of 30 who earn on average roughly 100,000 U.S. dollars per year. By manual observation, we could segment these observations into two somewhat distinct groups. Two groups allow us to show each group a unique marketing video. In this example, we want to deliver a marketing message geared towards their income level; we can segment our observations into group by those who earn more than 65,000 U.S. dollars and those who earn less than or equal to that amount. In Python code below, I'll separate our observations into two groups so we can color code them in a plot. The code below makes unique lists of x-values and y-values of each group to plot from each of those two lists so we can color coordinate the groups. In the plot below, we can see the lower earners as green in color and the higher earners as orange in color. While this method of segmentation works, it's imperfect. Notice how there are several observations in the bottom-left group that are orange and right next to green observations; you'd think they should be in the same group yet with our threshold, they're in separate groups. A threshold of 65000 U.S. dollars is rather arbitrary and did a poor job of grouping several nearby observations. What's the Value of Clustering Algorithms? In the example above, it was fairly easy to create two fairly distinct groups based on their income level. However, what if we collected more data in our survey or used more data based on customers' behavior within the app? We could easily gather 4 or more features on customers. Also, what if our app had tens of thousands of customers or even millions? This would be considered a large number of observations. With a larger number of features and observations, it'd be nearly impossible to segment the observations by arbitrary threshold to create distinct segments. Once we've collected additional features on each customer, we can no longer visualize the data on a 2-d plane as we did above too. 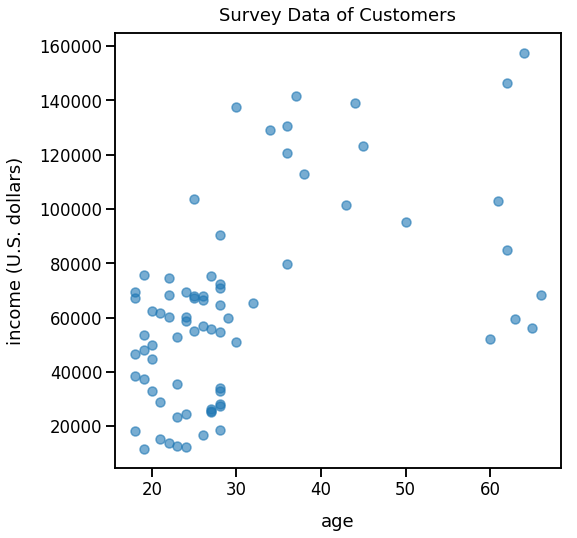 When is Clustering Used in Industry? In various programming languages, there are a number of open-source libraries to implement clustering algorithms. Popular ones include K-Means and DBSCAN. Different algorithms will often yield different observations per cluster. Therefore, it's best to understand your data well and study up on the types of algorithms available so you can get your desired results. In this post, I won't dive deep into the K-Means algorithm and explanations of the code below. I'll save that for another post. Let's focus on the last visualization and intrepret the results of this programmatic way to create two clusters. In the visualization below, purple dots are one cluster and yellow dots represent another cluster. The semi-transparent large circles are the centers/centroids of each cluster. Clustering better identifies nearby observations in the same cluster; we don't see two observations that have practically the same features but are in different clusters like we did with our manual segmentation above. Also, because of this centroid-based clustering, we can detail the features of the centroid to explain to our stakeholders the general features of our clusters.